This article is about the title in Christianity. For other uses, see Patriarch (disambiguation). The highest-ranking bishops in Eastern Orthodoxy, Oriental Orthodoxy, the Catholic Church (above major archbishop and primate), and the Church of the East are termed patriarchs (and in certain cases also popes). The word is derived from Greek πατριάρχης (patriarchēs), meaning "chief or father of a family", a compound of πατριά (patria), meaning "family", and ἄρχειν (archein), meaning "to rule". Originally, a patriarch was a man who exercised autocratic authority as a pater familias over an extended family. The system of such rule of families by senior males is termed patriarchy. Historically, a patriarch has often been the logical choice to act as ethnarch of the community identified with his religious confession within a state or empire of a different creed (such as Christians within the Ottoman Empire). The term developed an ecclesiastical meaning, within the Christian Church. The office and the ecclesiastical circumscription of a Christian patriarch is termed a patriarchate. Abraham, Isaac, and Jacob are referred to as the three patriarchs of the people of Israel, and the period during which they lived is termed the Patriarchal Age. The word patriarch originally acquired its religious meaning in the Septuagint version of the Bible. In the Catholic Church, the bishop who is head of a particular autonomous Church, known in canon law as a Church sui iuris, is ordinarily a patriarch, though this responsibility can be entrusted to a Major Archbishop, Metropolitan, or other prelate for a number of serious reasons. Since the Council of Nicaea, the bishop of Rome has been recognized as the first among patriarchs. That Council designated three bishops with this 'supra-Metropolitan' title: Rome, Alexandria, and Antioch. In the Pentarchy formulated by Justinian I (527–565), the emperor assigned as a patriarchate to the Bishop of Rome the whole of Christianized Europe (including almost all of modern Greece), except for the region of Thrace, the areas near Constantinople, and along the coast of the Black Sea. He included in this patriarchate also the western part of North Africa. 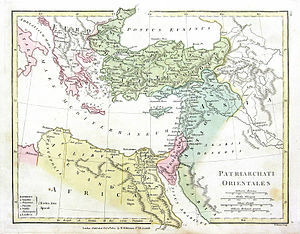 The jurisdictions of the other patriarchates extended over Roman Asia, and the rest of Africa. Justinian's system was given formal ecclesiastical recognition by the Quinisext Council of 692, which the see of Rome has, however, not recognized. There were at the time bishops of other apostolic sees that operated with patriarchal authority beyond the borders of the Roman Empire, such as the Catholicos of Selucia-Ctesephon. Within their proper sui iuris churches there is no difference between patriarchs and major archbishops. However, differences exist in the order of precedence (i.e. patriarchs take precedence over major archbishops) and in the mode of accession. Whereas the election of a major archbishop has to be confirmed by the pope before he may take office, no papal confirmation is needed for a newly elected patriarch before he takes office. Rather, a newly-installed patriarch is required to petition the pope as soon as possible for the concession of what is called ecclesiastical communion. Furthermore, patriarchs who are created cardinals form part of the order of cardinal bishops, whereas major archbishops are only created cardinal priests. Titular patriarchs do not have jurisdiction over other Metropolitan bishops. The title is granted purely as an honor for various historical reasons. They take precedence after the heads of autonomous churches in full communion, whether pope, patriarch, or major archbishop. The Latin Patriarch of Jerusalem, established 1099. The Patriarch of the East Indies a titular patriarchal see, united to Goa and Daman, established 1886. The Patriarch of Lisbon, established 1716. The Patriarch of Venice, established 1451. The Patriarch of Aquileia – with rival line of succession moved to Grado - dissolved in 1752. The Patriarch of Grado – in 1451 merged with the Bishopric of Castello and Venice to form the Metropolitan Archdiocese of Venice (later a residential Patriarchate itself). The Patriarch of the West Indies – a titular patriarchal see, vacant since 1963. The Latin Patriarch of Antioch – title abolished in 1964. The titular Latin Patriarch of Alexandria – title abolished in 1964. The Latin Patriarch of Constantinople – title abolished in 1964. The pope can confer the rank of Patriarch without any see, upon an individual Archbishop, as happened on 24 February 1676 to Alessandro Cescenzi, of the Somascans, former Latin Titular Patriarch of Alexandria (19 January 1671 – retired 27 May 1675), who nevertheless resigned the title on 9 January 1682. In theological and other scholarly literature of the Early Modern period, the title "Patriarch of the West" (Latin: Patriarcha Occidentis; Greek: Πατριάρχης τῆς Δύσεως) was mainly used as designation for the jurisdiction of the Bishop of Rome over the Latin Church in the West. From 1863 to 2005, the title "Patriarch of the West" was appended to the list of papal titles in the Annuario Pontificio, which in 1885 became a semi-official publication of the Holy See. This was done without historical precedent or theological justification: There was no ecclesiastical office as such, except occasionally as a truism: the patriarch of Rome, for the Latin Church, was the only patriarch, and the only apostolic see, in the "west". The title was not included in the 2006 Annuario. On 22 March 2006, the Pontifical Council for Promoting Christian Unity offered an explanation for the decision to remove the title. It stated that the title "Patriarch of the West" had become "obsolete and practically unusable" when the term the West comprises Australia, New Zealand and North America in addition to Western Europe, and that it was "pointless to insist on maintaining it" given that, since the Second Vatican Council, the Latin Church, for which "the West" is an equivalent, has been organized as a number of episcopal conferences and their international groupings. Though the formulation "Patriarch of the West" is no longer used, the pope in that role issues the Code of Canon Law for the Latin Church. During the Synod of Bishops on the Middle East in 2009, Pope Benedict XVI appeared, as patriarch of the Latin Church, with the other patriarchs, but without the Latin patriarch of Jerusalem, though he was present at the same Synod. The Patriarch of Rome; the Pope of Rome, originally "primus inter pares" according to Eastern Orthodoxy, recognized in 325. Currently not an Episcopal or Patriarchal authority in the Eastern Orthodox Church, following the Great Schism in 1054. The Patriarch of Constantinople, chief of the Orthodox Church of Constantinople and the "primus inter pares" of post-Schism Eastern Orthodoxy, recognized in 381. The Patriarch of Moscow and All Russia chief of the Russian Old-Orthodox Church. The Patriarch of Kyiv and All Rus-Ukraine of the Ukrainian Autocephalous Orthodox Church Canonical. The Pope of Alexandria and Patriarch of All Africa and the chief of the Coptic Orthodox Church of Alexandria in Egypt and All Africa and the Spiritual Leader of Oriental Orthodoxy. The Patriarch of Antioch and All the East and chief of the Syriac Orthodox Church of Antioch and Supreme Leader of the Universal Syriac Orthodox Church in the Near East. The Catholicos of the East and the chief Metropolitan of the Malankara Orthodox Syrian Church in India. The Catholicos of Etchmiadzin, Armenia and of All Armenians and Supreme Patriarch of the Armenian Apostolic Church and chief of the Armenian Apostolic Church. The Patriarch of Constantinople for the Armenians in Turkey. The Patriarch of Jerusalem and of Holy Zion for the Armenians in Israel, Palestine, Jordan and the Persian Gulf. The Catholicos of Cilicia and chief of the Armenian Apostolic Church of the Great House of Cilicia in Antelias, Lebanon. The Archbishop of Axum and Patriarch Catholicos of All Ethiopia and the chief of the Ethiopian Orthodox Tewahedo Church in Ethiopia. The Archbishop of Asmara and Patriarch of All Eritrea and the chief of the Eritrean Orthodox Tewahedo Church in Eritrea. Patriarchs of the Church of the East, sometimes also referred to as Nestorian, the Church of Persia, the Sassanid Church, or, in modern times, the Assyrian Church of the East, trace their lineage of patriarchs back to the 1st century. The Catholicos-Patriarch of Seleucia-Ctesiphon, chief of the Assyrian Church of the East. The Patriarch-Catholicos of the Ancient Church of the East, a secession from the Assyrian Church of the East. The term patriarch has also been used for the leader of the extinct, dualist, heretical Manichaeist sect, initially based at Ctesiphon (near modern-day Baghdad) and later at Samarkand. The Patriarch of the Brazilian Catholic Apostolic Church in Brazil. The Patriarch of the Venezuelan Catholic Apostolic Church in Venezuela. The Patriarch of the Catholic Apostolic Church of Antioch. The Patriarch of the Apostolic Catholic Church, in the Philippines. The Patriarch of the Ukrainian Orthodox Greek Catholic Church in Ukraine. The Patriarch of the American Orthodox Catholic Church. The Patriarch of the International Communion of the Charismatic Episcopal Church. In the Latter Day Saint movement, a patriarch is one who has been ordained to the office of patriarch in the Melchizedek priesthood. The term is considered synonymous with the term evangelist, a term favored by the Community of Christ. In The Church of Jesus Christ of Latter-day Saints, one of the patriarch's primary responsibilities is to give patriarchal blessings, as Jacob did to his twelve sons according to the Old Testament. Patriarchs are typically assigned in each stake and possess the title for life. ^ a b Online Etymological Dictionary: "patriarch"
^ American Heritage Dictionary of the English Language: "patriarch"
Herbermann, Charles, ed. (1913). "Patriarch" . Catholic Encyclopedia. New York: Robert Appleton Company. ^ Code of Canons of Eastern Churches. 1990. pp. 58–59. ^ "DOCUMENTS FROM THE FIRST COUNCIL OF NICEA". History Sourcebooks Project. Fordham university. Retrieved 30 September 2017. ^ "Patriarchs". GCCatholic.org. Retrieved 30 September 2017. ^ Maloney, G.A. (2002). New Catholic Encyclopedia (Revised ed.). Gale. pp. 15 vols. ISBN 978-0787640040. ^ Code of Canons of Eastern Churches. Catholic Church. 1990. pp. 151–154. ^ An example of the petition and the granting of ecclesiastical communion: "Exchange of letters between Benedict XVI and His Beatitude Antonios Naguib". Holy See Press Office. Retrieved 2013-01-18. ^ "Communiqué on title 'Patriarch of the West'". Zenit. 22 March 2006. Retrieved 20 December 2017. ^ "Meeting of the Eastern Catholic Patriarchs and Major Archbishops with Pope Benedict XVI". Society of St. John Chrysostom. 20 September 2009. Retrieved 30 September 2017. ^ Catholic Near East Welfare Association, a Papal agency for humanitarian and pastoral assistance Archived 2009-01-15 at the Wayback Machine (ID: 20). ^ Catholic Near East Welfare Association, a Papal agency for humanitarian and pastoral support Archived 2009-01-15 at the Wayback Machine (ID: 21). ^ Catholic Near East Welfare Association, a Papal agency for humanitarian and pastoral assistance Archived 2009-01-15 at the Wayback Machine (ID: 18). ^ Catholic Near East Welfare Association, a Papal agency for humanitarian and pastoral assistance Archived 2009-01-15 at the Wayback Machine (ID: 17). ^ Catholic Near East Welfare Association, a Papal agency for humanitarian and pastoral assistance Archived 2009-01-15 at the Wayback Machine (ID: 19). ^ Eglise Orthodoxe Autonome de France at the Wayback Machine (archived 8 December 2008). Nedungatt, George, ed. (2002). A Guide to the Eastern Code: A Commentary on the Code of Canons of the Eastern Churches. Rome: Oriental Institute Press. Current patriarchates of the Catholic Church (GCatholic). "Patriarch" . Encyclopædia Britannica (11th ed.). 1911. "Patriarchs" . Encyclopedia Americana. 1920.